Because I was busy writing my own novels this year (my first, Rogue Island was published in November), I read only 50 crime novels over the last twelve months — and reviewed even fewer for The Associated Press. That’s a lot less than in past years, so this list is drawn from a smaller than usual sample. If I missed something truly great, please let me know so I can go back and read it. 1. 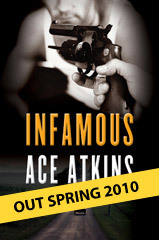 Infamous by Ace Atkins – A beautifully written fictionalized account of the kidnapping of oilman Charles Urschel by George “Machine Gun” Kelly in 1933 Oklahoma, based on meticulous historical research. 2. Last Talk with Lola Faye by Thomas H. Cook – A literary crime novel about the impact of a long-ago murder in a small southern town written by one of the finest contemporary writers working in any genre. 3. I’d Know You Anywhere by Laura Lippman – A suburban mom receives a letter written from death row by the man who had raped her two decades earlier. This ignites a series of surprising events in a subtle and emotionally satisfying novel as every bit as good as the author’s breakthrough 2009 book, Life Sentences. 4. Last Days of Ptolemy Grey by Walter Mosley – The author is best known for his superb crime novels featuring amateur detectives Easy Rawlins, Socrates Fortlow, and Leonid McGill, but he has always been an adventurous writer, trying his hand at everything from social commentary to science fiction. This novel about the trials and triumphs of a 91-year-old Alzheimer’s patient with unfinished business to attend to might be his most daring and brilliant work yet. 5. City Of Lost Girls by Delcan Hughes – In his fifth novel featuring private detective Ed Loy, the author takes us on a tour of the mean streets of Dublin in a lush, richly detailed story about the murder of young girls working as bit players in a big-budget movie. 6. The Glass Rainbow by James Lee Burke – New Iberia, LA, detective Dave Robicheaux is hell-bent on avenging the sadistic murders of two young girls in another powerful exploration of heroism and human depravity by one of the true masters of the genre. 7. Iron River by T. Jefferson Parker – The author explores the damage America’s appetite for illegal drugs does to Mexican society in this timely, swash-buckling tale of corruption and violence on the border. 8. The Devil by Ken Bruen – No one writes tighter prose than this Irish master of noir. In his eighth novel featuring Galway private investigator Jack Taylor, the battle-scarred hero confronts forces so evil that his true opponent might well be Satan himself. 10. 61 Hours by Lee Child – The nomadic Jack Reacher, the closest thing we have to a 21st –century Lone Ranger, confronts a mysterious threat in a bitterly cold South Dakota town in what might be the most suspenseful story yet in this long-running, deservedly-popular series. This entry was posted in Uncategorized and tagged ace atkins, best list, Bruce DeSilva, crime fiction, Declan Hughes, James W. Hall, Ken Bruen, Laura Lippman, Lee Child, mysteries, noir, Rogue Island, T. Jefferson Parker, Thomas H. Cook, thrillers, Walter Mosley. Bookmark the permalink.